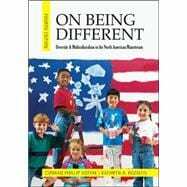 On Being Differentprovides an up-to-date, comprehensive, and interdisciplinary account of diversity and multiculturalism in the United States and Canada. Kottak (recent inductee to The National Academ of Scineces) and Kozaitis clarify essential issues, themes, and topics in the study of diversity, including ethnicity, religion, gender, and sexual orientation. The book also presents an original theory of multiculturalism, showing how human agency and culture work to organize and change society. The authors use rich and varied ethnographic examples, from North America and abroad, to help students apply the material to their own lives, and thus gain a better understanding of diversity and multiculturalism.